Two genres of video games that I have always enjoyed are puzzle and co-op games. Growing up in the 1990s I enjoyed playing splitscreen games with my brother. While there are a decent amount of co-op puzzle games, I can never get enough of them as when they are done right they can be fantastic games. With my brother and I both being fans of puzzle and co-op games we decided to try out today’s game 39 Days to Mars. 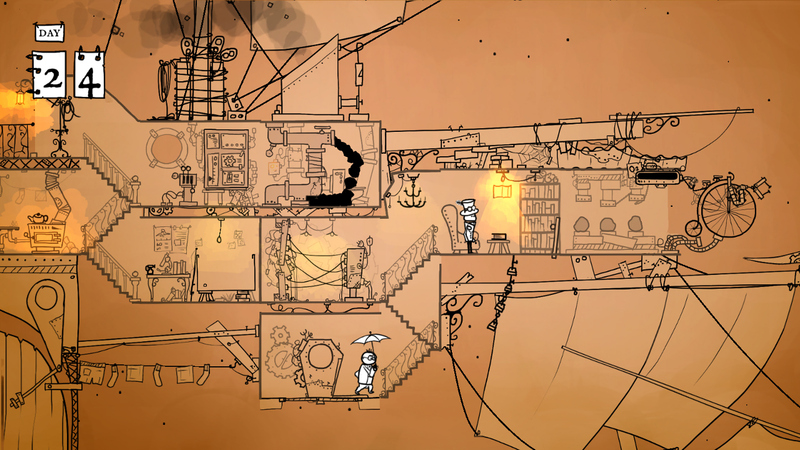 39 Days to Mars is the perfect example of what co-op puzzle games should strive to be outside of its one fatal flaw. We at Geeky Hobbies would like to thank It’s Anecdotal for the review copy of 39 Days to Mars used for this review. Other than receiving a free copy of the game to review, we at Geeky Hobbies received no other compensation for this review. In 39 Days to Mars you and a partner will play as Sir Albert Wickes and The Right Honorable Clarence Baxter. These two gentlemen are 19th century explorers who have decided to undertake a voyage to Mars on their ship the HMS Fearful. These are not your typical explorers though. Their ship HMS Fearful is handmade which shows as things never go as planned. Players have to work together in order to fix the regular mishaps of the ship in order to successfully make it to Mars. While 39 Days to Mars has a single player mode (more on this later), as the game makes perfectly clear this is a game that is meant to be played with another player. You could solve a couple of the puzzles by yourself but a majority of the puzzles require the two players to work together in order to complete them. For example one of the first puzzles you encounter in the game is a typical jigsaw puzzle. You need to put the puzzle together in order to unveil the map that you are going to use for your journey. This might sound easy but players cannot fully control the pieces by themselves. A player can grab and move a piece by themself but both players have to work together in order to turn them so they fit together. I have to say that it is quite a bit more challenging putting a jigsaw puzzle together when you are relying on another player to help you turn the pieces. This co-op element is where 39 Days to Mars excels. The game does a great job creating a co-op puzzle game where you need to rely on your teammate in order to succeed. There are a couple puzzles that you could finish by yourself but most of the puzzles require you to work well with your teammate. The reason that 39 Days to Mars does such a great job creating a co-op experience is that both players have to do some of the tasks as it is impossible to do everything yourself. This requires the two players to have good communication and work well together. Usually I would consider this a problem but I actually like how the game presents its puzzles. The game really doesn’t give you much of an explanation of what you are supposed to do in a lot of the puzzles. While quite a few of them are pretty self explanatory, there are a lot of puzzles where you have to experiment to find out what you are supposed to do. I think this works well with the co-op nature of the game as the two players are frantically trying to figure out what they are supposed to do when they are presented with a new puzzle. After your first time through the game you will know how to solve all of the puzzles which kind of takes away some of the mystery of figuring out what to do yourself. If the game just told you what you were supposed to do for the puzzles, the puzzles would be really easy and wouldn’t be as interesting. As far as the controls there are things to like and there are a couple things that I think could have been done better. The game succeeds at making the game accessible to pretty much anyone who has ever played a video game before. This is not a game that you have to be a regular video game player to enjoy. The game recommends using a controller which requires you to only use two buttons. You use one of the joysticks to move around and one button is used to select and drag things in some of the puzzles. With such basic controls 39 Days to Mars is a game that you can play with someone who doesn’t play a lot of video games. The one problem that I had with the controls is that they can feel a little stiff from time to time. I will note that we played a pre-release version of the game so these issues may already be fixed. These problems weren’t that drastic either. Mostly there were some instances where it felt like we should have grabbed something and the game didn’t register it. As a lot of the puzzles aren’t time sensitive this isn’t a huge problem. I just wish the controls would have been a little more precise. I also think 39 Days to Mars does a great job with the atmosphere. The art style might not be for everyone but I think it works really well for the game’s theme. While I don’t think this comparison is great, 39 Days to Mars kind of reminds me of Wallace and Grommit. The characters don’t have a lot in common with Wallace and Gromit (outside of being British) but I like the comparison because the mood of the game reminds me of that series especially since both love their eccentric inventions. When you add in the game’s nice piano music, the game has a really nice laid back feel to it that I really appreciated. While I played through 39 Days to Mars a couple times with another player, I wanted to quickly check out how the single player works for those people who don’t have another person to play the game with. The single player technically works but I don’t think I would recommend it. Basically the single player works the same as the co-op game. The only real difference is that you have to control both people in the puzzles. I thought this might actually be easier for some puzzles as you wouldn’t have to communicate every action with the other player. As I soon learned though it makes the game quite a bit harder. Maybe it was just me but I had a hard time being able to operate both players at the same time which is necessary for some of the puzzles. To control both players at the same time requires a lot of multi-tasking. The main reason that I wouldn’t recommend the single player is that this is the type of game that is just better with another player. I found the game to be kind of boring playing it by myself. So I was really enjoying 39 Days to Mars and then the game suddenly ended. While the game advertises that you can complete the game in an evening, I thought this meant that the game was going to be around three hours long. It turns out that your first time playing the game will only take you 30-60 minutes. Each subsequent adventure should take even less time. This is disappointing for a couple reasons but the biggest is that I was really enjoying the game and then it suddenly ended. I think the game could have had so much more content and I would have loved it. So after the first time through the game I was assuming that this must be one of those games that have a branching storyline. The other player and I did pretty good our first time playing the game but there were areas where we messed up. We assumed that if we played the game again the journey would change and we would get different puzzles/mini games. Unfortunately that is not the case. Each time you play the game the puzzles work the same with some slight changes so the solutions aren’t always the same. As you already know what you are supposed to do in the puzzles, each time you play the game it becomes easier and shorter. Outside of some slight tweaks to the story, your success/failure also doesn’t appear to impact the overall story much and doesn’t give you different puzzles. As the game doesn’t really change much between playthroughs, after a couple games you will have seen everything the game has to offer. This might take you two to three hours. If you are an achievement hunter I could see playing through the game a couple more times in order to get the rest of the achievements. In total if you want to 100% the game I would guess that you would need to play the game for around 4-5 hours. I generally don’t like to discuss price in reviews but I think it is warranted for 39 Days to Mars. 39 Days to Mars is retailing for $14.99. There is a lot that I really like about 39 Days to Mars but I think the price is a little steep for a game that most people will only play for two to five hours. If you like co-op games you will enjoy your time with the game but you aren’t getting a lot of bang for your buck with the game at $14.99. If price doesn’t really matter to you I have no problem recommending you pick up 39 Days to Mars right away. If you are a more price conscious customer though I might recommend waiting for a sale on the game. At the end of the day there is a lot I really liked about 39 Days to Mars. The co-op gameplay is actually really good and compelling. 39 Days to Mars does a great job of utilizing the co-op nature of the game. The puzzles are well designed and they force players to work together in order to succeed. The game has a single player mode but I would highly recommend playing the game co-op as this is the type of experience that is more enjoyable with another player. The game is pretty accessible as well so you can play it with someone who doesn’t play a lot of video games. On top of all of this I really liked the game’s atmosphere. With all of this going for the game it is such a shame that the game is so short. When you finish your first playthrough you are going to wish there was more to the game. Playing through the game a second time slightly changes things but things are still the same for the most part. Unless you are an achievement hunter you may only get around two hours out of the game. As far as recommendations it comes down to two things. If you either don’t like co-op puzzle games or don’t have someone else to play the game with, 39 Days to Mars won’t be for you. If you like co-op puzzle games though I would be surprised if you didn’t enjoy 39 Days to Mars. The problem is that with the game being so short I don’t know if it justifies the full retail price. If you don’t really care about the price, I have no problem recommending that you pick up the game. If you are more price conscious though I might suggest waiting for the game to go on sale. A great co-op puzzle experience. Is a lot shorter than it should be. The controls are a little stiff from time to time.